There’s a new line of cleaning products in town and you can find them exclusively at Walmart. 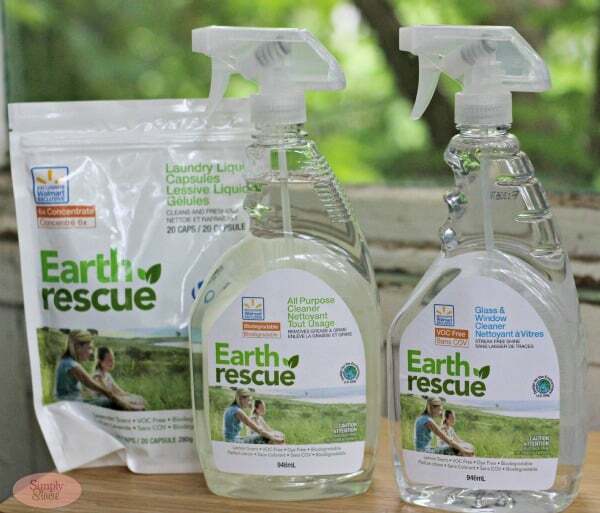 Introducing Earth Rescue’s line of natural cleaning products! If you worry about chemicals that you are adding to your home every time you clean, it might be worth giving a few of these products a try. I can’t function when my home is a mess, but I have often wondered in the past about the types of chemicals I’m leaving behind after the dirt and grime is gone. These are all awesome benefits, but do products actually work begs the question? My answer is that yes they do! I tried out three Earth Rescue products: Laundry Liquid Capsules, Glass & Window Cleaner and All-Purpose Cleaner. The Laundry Liquid Capsules have a mild lavendar scent and come in bags of 20 capsules. They are 6x concentrated and you simply toss one a capsule in for normal loads and two if the clothes are really dirty. It will dissolve at any water temperature. This past weekend I was washing all our old linens as well as our new linen we bought for our new bedroom. They came out clean and fresh. I don’t like a lot of scent on my laundry and the Earth Rescue brand was just the right amount. It wasn’t overpowering as some detergents can be. The Glass & Window Cleaner worked wonders on getting my new bedroom furniture nice and shiny! I bought the furniture back in October while our master bedroom was still under renos. We had to put them in storage till the room was ready. When we moved everything in the new space on the weekend, everything was covered in a layer of dust and looking dull. The dresser mirror needed a good cleaning. It can be used on windows, glass, mirrors, bathroom fixtures, countertops and most hard surfaces. I cleaned the windows and the dresser mirror and not only did it get rid of the dust, but it also left a streak-free shine! Last but certainly not least, I tried the All Purpose Cleaner. Like it’s name says, it can be used on multiple surfaces in your home like nonwood countertops, floors, sinks, appliances and toilets. I cleaned my tiled countertop in my kitchen as well as giving my the face of my dishwasher, stove and fridge a quick wipe. It’s amazing what a little cleaner can do to freshen up the room! Next time your shopping at Walmart, check the cleaning aisle for Earth Rescue products and give them a try. In the meantime, I’ll be enjoying my brand new (and sparklin’ clean) bedroom! Congrats to Walmart having a great product without all the chemicals. I like the new Earth Rescue brand and will have to look for it soon. I am going to get the glass cleaner! This is great to know. We have pets and I really try to reduce the number of chemicals we use. I will definitely check these out next time I am in Walmart! I haven’t tried this brand, but I love natural cleaners like this. Also? your bedroom looks amazing. I will definitely have to check these out next time I am at Walmart, thanks for the great idea. I love trying new and Eco friendly products especially for cleaning, which I do a lot of!! good to know, I always assume they don’t work as well. I’ll have to pick some up on my next Walmart trip! I will pick some of these products up on my next trip to Walmart! Thanks for the info, I had no knowledge of these products! Those sound great. I’ll have to try those. Awesome review. Must give it a try. Ill check out Walmart this weekend! I like the laundry capsules – they sound terrific! I like controlling the amount of detergent and use and am glad this is natural and works well! Thanks for the review. It gives me confidence when somebody has tried and liked it. I love that the Glass and Window cleaner was so versatile. I was surprised the Laundry Liquid Capsules didn’t have a sharp scent when you pulled them out of the dryer. I have real sensitive skin and that would be a plus for me. Thank you for a thorough review. Thank you for sharing. I love all purpose cleaners. Must check out the glass and window cleaner. These products sound wonderful. I really want to try the Laundry Liquid Capsules. I like that they don’t have a strong smell. We have lung issues at our house and can’t have a lot of strong smelling things in the house. These products sound like such a great idea. As you pointed out with so many chemicals out there I too wonder what the effects from these can be. you have beautiful furniture ! im glad the products worked for you, I will have to try them out! It’s good to know this green product line is available at Walmart, very accessible! How great hat these actually work! Sometimes natural cleaners don’t seem to disenfect. No harmful chemicals, cleans well, and smells nice. Sounds like just what I want from a cleaner. I didn’t know about these products. Thanks for sharing. I do worry about adding chemicals to my home every time I clean so I really appreciate hearing about VOC and solvent free products. Thanks! Hey, I was wondering if you could know the actual ingredients in the earth recuse products. I’ve looked everywhere and I can’t find what’s in it. If you can find the list of ingredients, let me know. thank you!